What a fantastic treatise and reference On Tactics by B.A. Friedman is. On Tactics, B. A. Friedman states, is intended to be the remedy to the chaotic and thus far unformed realm of tactical theory. He is speaking to the military, but the same holds true for policing who all too often focus their efforts on skills and technique development with no real understanding of the tactical principals, or "tactical tenants" as Friedman calls them. Part One of the book will establish a tactical system meant to replace the Principles of War checklist. First, the contextual role of tactics with regards to strategy and war will be established. This will necessarily lean on major strategic theories in order to illuminate the role of tactics. This section will be formed around the Physical, Mental, and Moral planes of battlefield interaction used by theorists such as J.F.C Fuller and John Boyd. Those who frequent this blog know the moral, mental and physical categories of conflict is and area we spend a lot of time focusing our efforts on and Friedman does a fantastic job explaining these and how they influence not only our tactical decisions and the outcomes of conflict but how they are perceived by the uncommitted which in the case of policing is the public. If police work and warfare for that matter, in general, are about the restoration of peace and tranquility or law and order to a community is it not crucial that we have and understanding of the why behind the tactics we use and how those tactics influence our strategy? 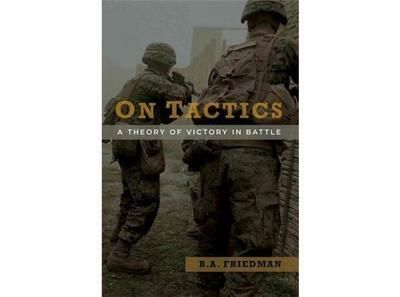 Friedman's focus is the military, but I see the connection to how his work on tactics relates to policing as well. Each category or plane as Friedman describes them, will then be examined in turn, and many of the classic Principles of War will be discussed along with some new ones. It will present some standard methods that tacticians can use to gain an advantage on the battlefield using historical examples that illustrate each concept. These “tactical tenants” include maneuver, mass, firepower, tempo, surprise, deception, confusion, shock, and the role of the moral aspects of combat. The traditional principles of war also do not address the three planes on which tactics occur: the physical, the mental, and the moral. This work presents nine tactical tenets arranged by those three planes. The four physical tenets are maneuver, mass, firepower, and tempo. The four mental tenets are deception, surprise, confusion, and shock. The moral plane stands alone as it is too intangible to be reduced to strict codification, but the moral power of opposed combatants is a weapon that cannot be ignored. The four physical tenets are the ways that a tactician can arrange his forces on the battlefield, or in policing how we can arrange them on the street in handling crisis and conflict. Effective use of each raises the probability of victory in the tactician’s favor. An ambush is an ideal example. The tactician masses his forces and his available firepower against the expected flank of an enemy force, which is maneuver. He also controls the tempo of the contest by reducing the enemy’s ability to react. The true power of the ambush, however, lies not in these physical deployments but rather in the mental effects produced in the minds of its victims. The deceptive nature of a successful ambush causes surprise, shock, and confusion once it is revealed. Even the most battle-hardened and well-trained forces are not immune to the mental effects. Last, the combined mental effects caused by physical deployments harm the moral cohesion of a military unit. Every military unit is bound together into a whole by various factors: duty, patriotism, training, shared experience and privation, and the morale of its members, to name just a few. Moral cohesion keeps the unit in the fight and striving toward its mission. Once the well of a unit’s cohesion is depleted or overcome, it ceases to function as a unit. The goal of a tactician, victory, is to shatter or deplete the opponent’s moral cohesion while simultaneously preserving the moral cohesion of friendly units. Friedman also understands that conflict is probabilistic and full of paradoxes and talks about the importance of decentralized control or a mission command climate that allows decisions to be made where the rubber meets the road. "While the sinews of war may be infinite funds, the sinew of tactical prowess is a common outlook, one that contextualizes and unifies doctrine, history, and experience across a military force. One cannot standardize everything, especially experience. But one can instill in troops a common outlook that they will use to analyze doctrine, history, and the experience they gain." Friedman explains how to do this very well. I highly recommend this book. For me it will be a constant companion and reference.